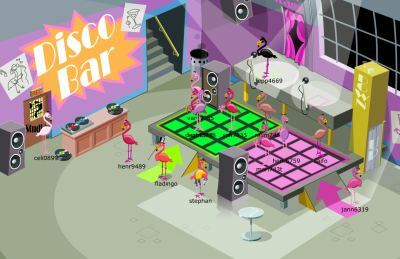 This week we launched The Club in Mingoville Virtual World where the kids are the stars. They can go in the Studio to record their song and then play it to their friends from the stage. 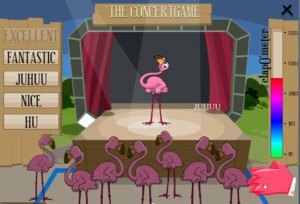 This is the second blog post in the series about our virtual English learning games. Last blog was about Quiz talk, if you missed it, read it here. This current blog will give parents and teachers an impression on what Super Star is. How do kids learn English playing SuperStar? SuperStar is located at The Club. In SuperStar, the student gives a live concert using one of his recorded songs from his “My Book” repertoire or by going in the studio to record a song from the song catalogue. All songs are in English and they all relate to the different mission themes in Mingoville e.g. The Body or My family. The songs wrap up the vocabulary of each mission and set it into a context in the lyric of the songs. Super Star is based on the content the students generate just as The Quiz Talk. Furthermore, it’s developed around social learning principle as it requires an audience to give a concert. The more people come to your concert, the higher possibility of a loud applause which generates many points. All participants in SuperStar earn points based on their level of participation. The idea of developing a social learning game based on the work the students produce results in a high interaction and thus intensive immersion into the English language because the students are having fun while using the language. To play SuperStar, a student needs to record at least one of the 10 sing-a-long songs from the Mingoville karaoke album. The recording of a song can take place either as part of a mission or directly from the Studio in The Club. All songs produced will appear in the student’s “My Book” as part of the portfolio. The game starts when the student enters the stage and the audience has checked in. The student can either invite his buddies to the concert or other students can drop in. The concert is open to everybody. The higher applause from the audience during the concert, the more funky moves the performer can make on stage and the more points he gains. All participants in the game earn points based on their engagement thus the more you cheer as the audience the more points you gain. The game in itself is designed to motivate the students to practice vocabulary and a good pronunciation in a fun environment using media which is already very familiar to them. Future development could be the possibility of dressing your flamingo in different wardrobes related to stars, the integration of cell phones to record and upload songs and maybe even some video clips. This entry was posted in Mingoville, News and tagged English for kids, ESL for kids, free online English for kids, game-based learning, virtual world by . Bookmark the permalink. hi, I am ali I want learn English. HI , GOOD NIGHT, MY NAME’S PATRICIA , I DON’T SPEAK INGLES VERY WELL BUT I’D LIKE TO KNOW IF IS POSSIBLE WE HAVE ANOTHER MUSICS, FOR EXEMPLA : SONGS OF ROXETTE OR CELINE DION AND ANOTHER SINGERS. I LOVE THIS SITE, I THINK IT IS VERY INTERESTING TO SPEAK AND LEARNING WITH PERSON IN THE WORLD, I’D LIKE TO THANK ALL THE PEOPLE THAT CREATED THIS SITE. Dear Patricia – Thank you. Your comment made everybody on the team very happy. I think your English is very good – keep up the good work. It’s a great idea with more songs in Mingoville. Unfortunately we cannot have other people’s songs in Mingoville – we don’t have the right to use their music, but we might produce new song for the karokee album. I will pass you idea on to the game team. How can I save my results; how can I save my points / coins? Because now I loose my points each time I leave the site. Ooh oops i just typed a big comment and when i submitted it it come up blank! Please please tell me it worked right? I dont want to write it again if i do not have to! Either the blog glitced out or i am just stuipd, the latter doesnt surprise me lol. We were looking for this anywhere! Thanks, finally! Quero aprender a falar ingles, porque só sei algumas palavra e frases. desculpem encomodar de novo mas esqueci-me de dizer que n consigo entrar aqui nos jogos o que é que se passa? Olá, está tudo bem por aqui?O JuneRosendahl não me responde, ele já apareceu por aqui?É que eu não o vi aqui.Xau. OLÁ . TUDO BEM ? ola mana, tudo bem contigo? ola, esta tudo bem e contigo?